The Zojirushi NHS-18 is a good and affordable 10 cup rice cooker that is suitable for folks who cook white rice on a daily basis. Although the NHS-18 can also handle brown rice, like with all basic rice cookers there will be some slight trial and error regarding the water to rice ratio. Also keep in mind that fewer cups of brown rice can be prepared as opposed to white rice. For white rice this 10 cup Zojirushi rice cooker can prepare up to 30 cups cooked rice, (in rice-cooker-sized measurements). Expect less capacity for brown rice. The Zojirushi NHS-18 is very simple to use since all one needs to do is add rice and water, plug in, and press down on the lever. Depending on the capacity added, the rice cooker will complete the meal in around 20 to 25 minutes, then switch into a keep warm mode that will hold the rice at a moist and ready to serve temperature for up to 5 hours. 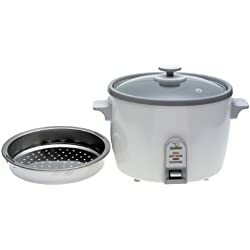 Another plus benefit some folks should find helpful is that this model is a steamer cooker as well and allows the user to steam food while their rice is cooking using the included stainless steel tray. This is great for health conscious people since they can prepare a healthy meal all in one unit. We should mention however that the steaming tray can only accommodate enough vegetables, fish, or poultry for about 3 to 4 people max. The rice bowl capacity is good for feeding 8 to 10 people. The Zojirushi NHS-18 comes with a measuring cup, rice spatula, steaming tray, and instruction manual specifying correct measurements. Judging by the pros & cons, and to conclude, we believe that the Zojirushi NHS-18 is a good buy for the price and would be a nice addition to any kitchen or household as well as making a great gift! This unit may not offer the same rice quality and diverse settings as the more expensive micro-computerized fuzzy Logic 10 cup rice cookers, but will still get the job done when needing a quick bowl of well-cooked white rice. Furthermore, we would also like to state that many folks recommend rinsing the rice well before cooking to help avoid or decrease the starchy spitting as mentioned in the above “cons list”. Please be aware that this is common for all basic top lid rice cookers using this rapid-boil style method of cooking rice and is not isolated to this specific model. Adding some olive oil or a little butter in the rice will also lessen the likelihood of rice crusting on the bottom as well as bubbling and spitting out of the steam hole.